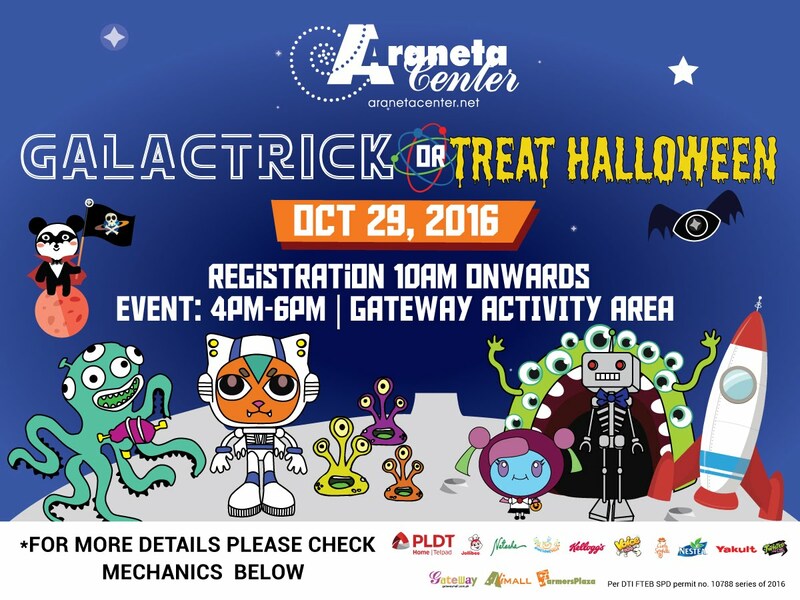 Halloween is creeping up fast, and the Araneta Center has everything planned out to give kids a fun and spooky experience! 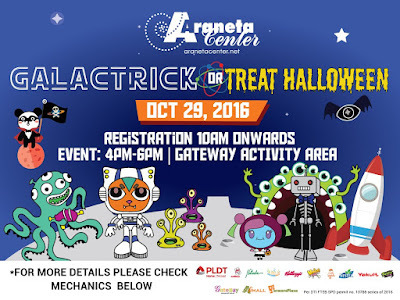 On October 29, Araneta Center is throwing simultaneous kiddie parties dubbed “GalacTrick or Treat Halloween” at Gateway Mall, Ali Mall, and New Farmers Plaza. Kids learn best when they’re having fun so the mall activity areas will hold interactive learning sessions for them. Kids of all ages can participate in Mad Science games like Find the Eyeball in the Haystack, Witch Pitch, Mystery Bowls, Halloween Bowling Game, and Halloween Ring Toss. Girls can also pamper themselves by stopping by the Kiddie Salon and Kiddie Face Painting stations on-site. To stock up on candies and other goodies, kids can go Halloween trick-or-treating starting at 1 pm. Routes and different pit stops will depend on the mall they are registered in. To add to the fun, kids can try out some cool science experiments at Mad Science stations like Tornado Terminal and Galaxy Putty at Ali Mall. Sound-making and polymer experiments are also sure to capture the kids’ interest at the Sound Station and Slime Booths at New Farmers Plaza. These Mad Science booths will start at 10 am. To top it off, a spectacular Mad Science show will also be held at 2 pm at the Gateway Mall! All these playful activities can be enjoyed by presenting P500 worth of single receipts of purchases made from October 24 until October 29. Registration at each mall starts at 10 am. Kids are encouraged to come in amazing costumes for a chance to win exciting prizes up to P5,000! The kiddies dressed in space-themed costumes can join the traditional Halloween costume contest at 4 pm in Gateway Mall. Costumes will be judged mainly on originality, followed by creativity and stage presence. Prizes will be given to the little tykes chosen as Little Mr. GalacTrick or Treat, Little Ms. Galatrick or Treat, Cutest Costume, Best Handmade Costume, Funniest Costume, and Crowd Favorite. As an added treat, regular mall-goers can get a free Coca Cola drink by answering a Halloween-inspired word game at Gateway Food court. Also check out Araneta Center’s pre-Halloween digital promo for a chance to win three Samsung Galaxy tablets. For full mechanics and updates, visit Araneta Center website at www.aranetacenter.net as well as its official Facebook page and Twitter account.